Another year, another All-Star season for Patrick Kane. Although the Chicago Blackhawks are in the Central Division cellar, the 30 year old earned his eighth All-Star nod with 31 goals and 75 points on the season, both ranking second in the NHL. Patty Kane: Hard to stop. The Blackhawks are playing the Minnesota Wild on Saturday night, and Wild head coach Bruce Boudreau was asked about his approach to shutting down Kane. His answer effectively sums up the challenge of going against Kane. 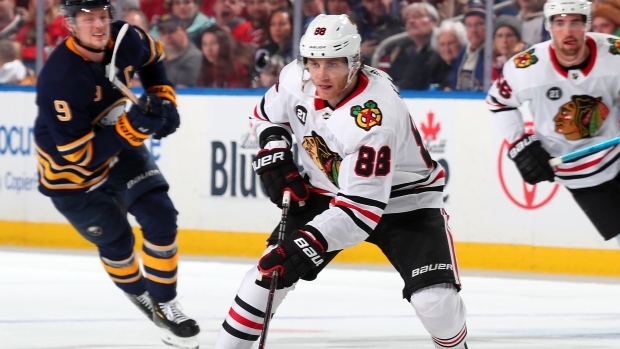 Despite some stellar seasons from individual players — like Kane, Jonathan Toews and 21 year old Alex DeBrincat have played well — the team continues to struggle. Of course, one line’s worth of players doesn’t make a team, but you still have to watch out for these guys on any given night. They’re that good. #PatrickKane has been on 🔥 lately. Where does he sit in the #Hart rankings?